Long before being known as the Steel City, Pittsburgh was America's Glass City. 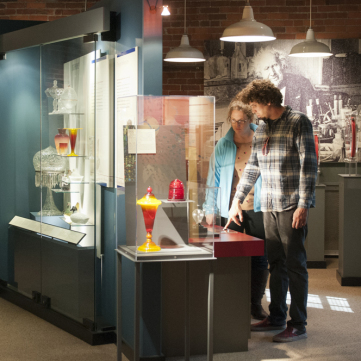 The Glass exhibition showcases the beauty, science, utility and technology of Western Pennsylvania glass over the past 200 years. While the story of glass in America began at Jamestown in 1608, almost 200 years passed before skilled glassworkers crossed the Allegheny Mountains and began production in Western Pennsylvania. Since 1797, when the region’s first two glasshouses opened, the conical furnace stacks of glass factories have been a defining feature of the region’s skyline. Scores of glasshouses followed, producing rivers of glass for an abundant variety of uses around the nation and eventually around the world. 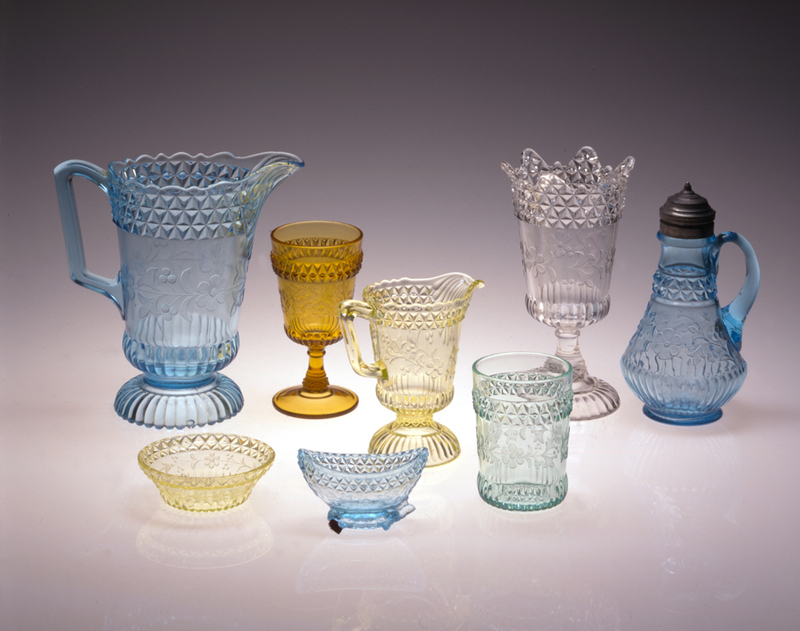 By the Civil War, the Pittsburgh region reigned as the center of the nation’s glass industry. 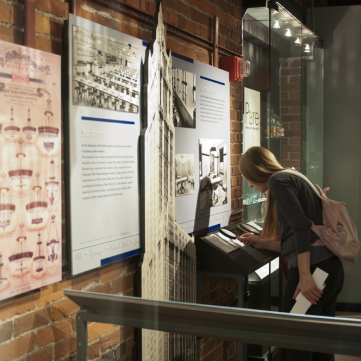 A generation later, Pittsburgh glass could be found everywhere: as tile for the walls of New York’s great transportation tunnels, in the searchlights on the Panama Canal, as insulators for endless miles of wire; in “Liberty lens” headlights for Ford automobiles, in beer halls and in bars. Yet this region also produced glass fine enough for use on the White House tables of five U.S. presidents and in embassies around the world. 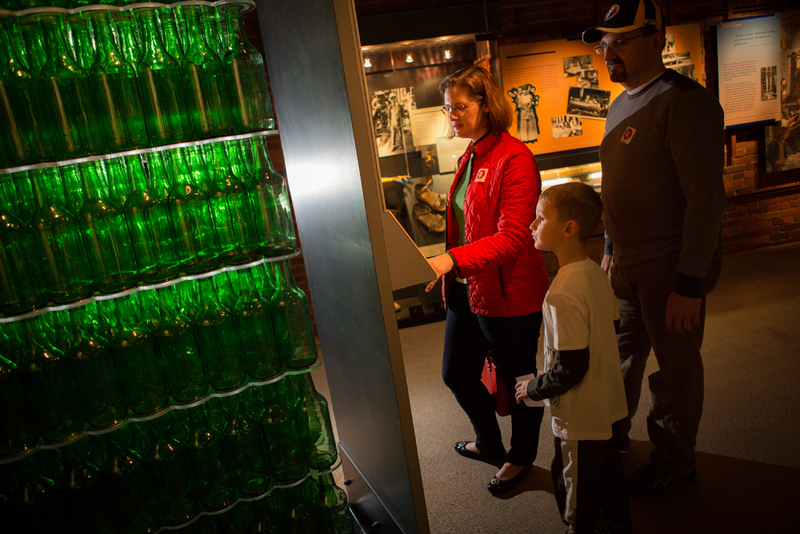 Bottles by the boxcar load and singular presentation pieces, Pittsburgh factories made it all. Gas and electric streetlights, lamps, light bulbs, and lamp chimneys, our factories lit the world. Lenses and traffic signals brought order and safety to railways, roadways, and runways and plate glass for large windows made department stores a reality, allowing consumers to shop from the sidewalk. Store fronts of Carrera glass, basement windows of glass block, skyscrapers sheathed with reflective glass windows – the uses for glass seemed endless. 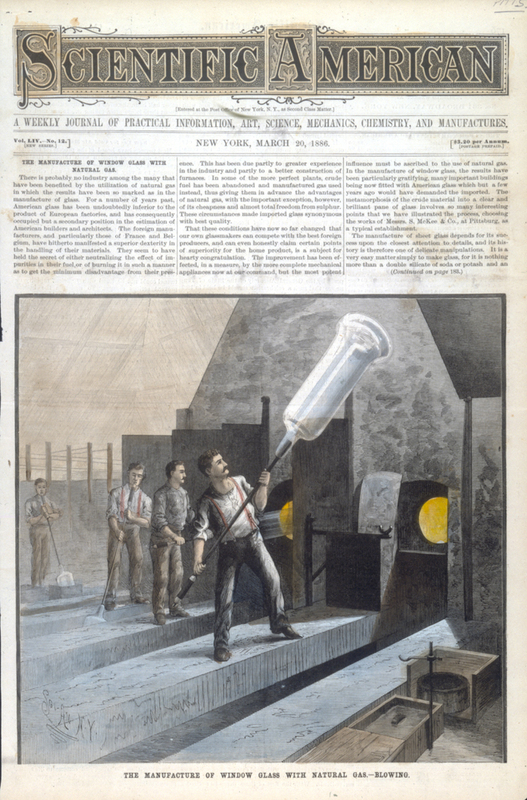 The Pittsburgh region became a center for the production of glass, but also for innovations in its manufacture, design, and marketing. 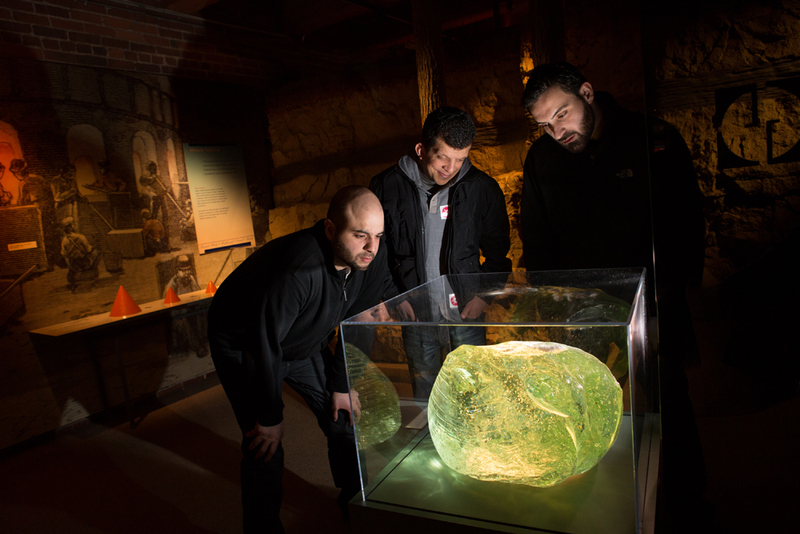 Glass: Shattering Notions tells that story, unraveling the complex 200 plus year history of this region’s first industry. 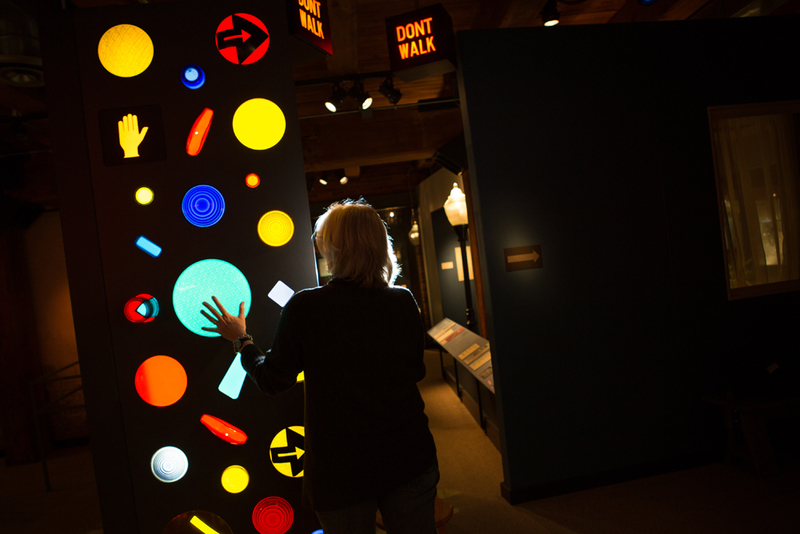 With one of the premier regional collections of glass known, the exhibit features more than 500 glass objects, immersive environments, hands-on interactives, and audio and video to help you look at, not through the glass in your life and hopefully see and understand it in a new way. The first two glass factories west of the Allegheny Mountains both opened in our region in 1797. Both made window glass and bottles. The main raw material used to make glass is quartz sand or silica. 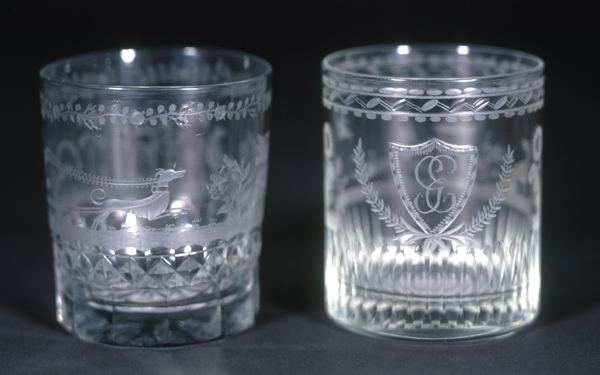 By 1875 the Rochester Tumbler Company of Rochester, Pa. boasted it could make 500,000 pieces of glass a week. 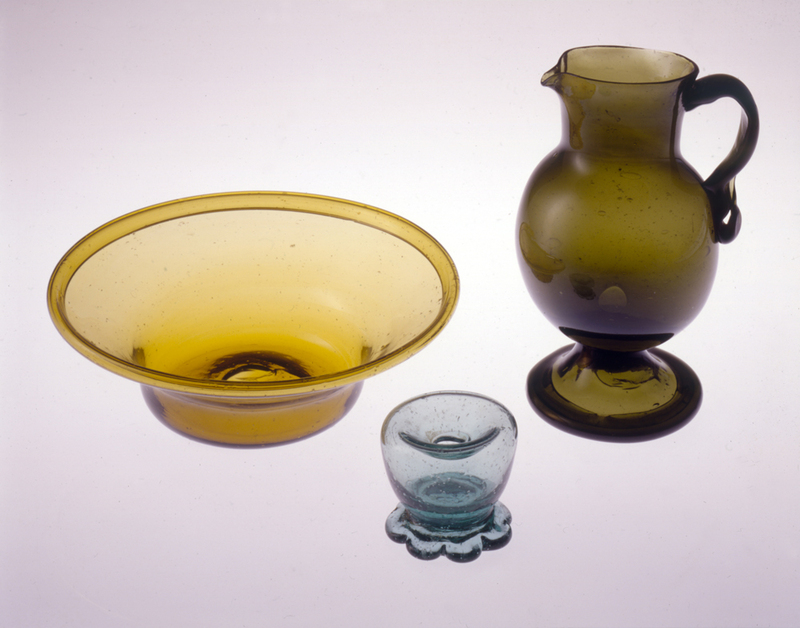 Some yellow or yellow-green “vaseline glass,” popular from 1880 to 1920, contained uranium, added to give it the bright coloration. 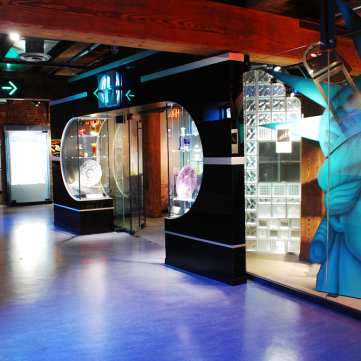 When the Statue of Liberty underwent restoration for the nation’s bicentennial in 1976, locally based TRACO crafted the 25 windows for her crown. See one in the exhibit! 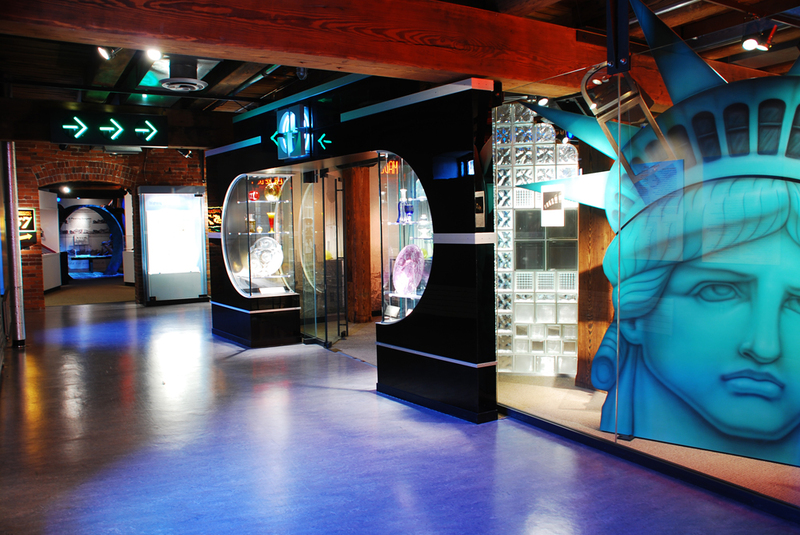 Each window differed in size, so the team dedicated 2,000 man hours and made eight trips to Liberty Island to size and create each bronze encased window. 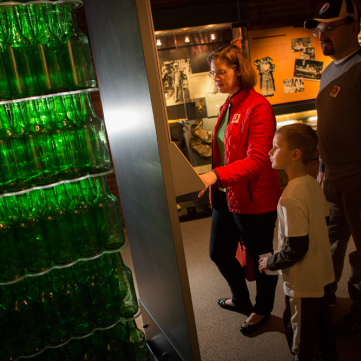 In this KQV Radio History Minute, History Center President and CEO Andy Masich discusses how Pittsburgh and Western Pennsylvania produced 80% of the nation’s glass by 1920. 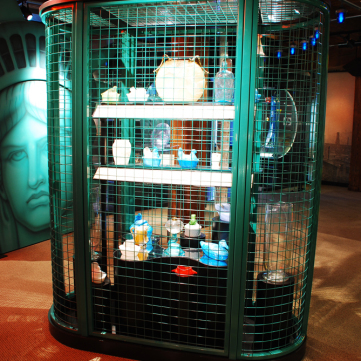 Zoo case – Glass birds, fish, animals, and more all are corralled in our zoo case. Steamboat salts – Pittsburgh honored its reputation as the Gateway to the West and a center for steamboat building with these delicate pressed steamboat salts. 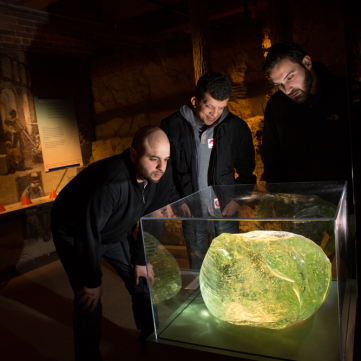 Giant piece of glass cullet – A piece of waste glass had to be chipped out of the furnace at L.E. Smith in Mount Pleasant, Pa. after the material failed to melt properly. Window glass video – Rare footage shows Belgian blowers making cylinder window glass in Jeannette in 1905. Soon after, drawing machines replaced skilled blowers on the factory floor. Fry FOVAL lamp – Made from the same glass the Fry Company of Rochester, Pa. used in their ovenware, this delicate lamp is one of only a few known. 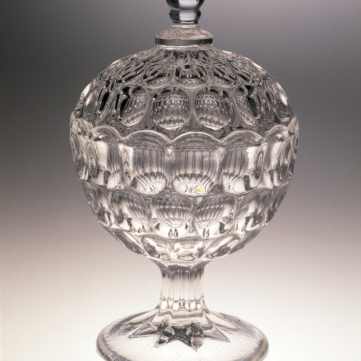 Pattern glass sugar bowl – Likely made by the McKee Glass Co. of Pittsburgh, this c. 1850 sugar bowl has a piece of pressed glass on each panel of the body and lid and serves as an advertisement for the company’s wares. 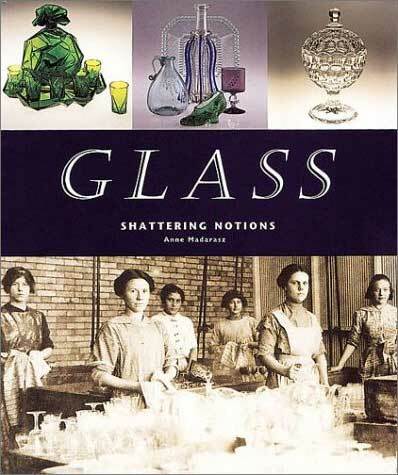 A companion book, “Glass: Shattering Notions,” written by History Center’s Anne Madarasz, tells the story of glass on a local and national scale through numerous personal and business histories. 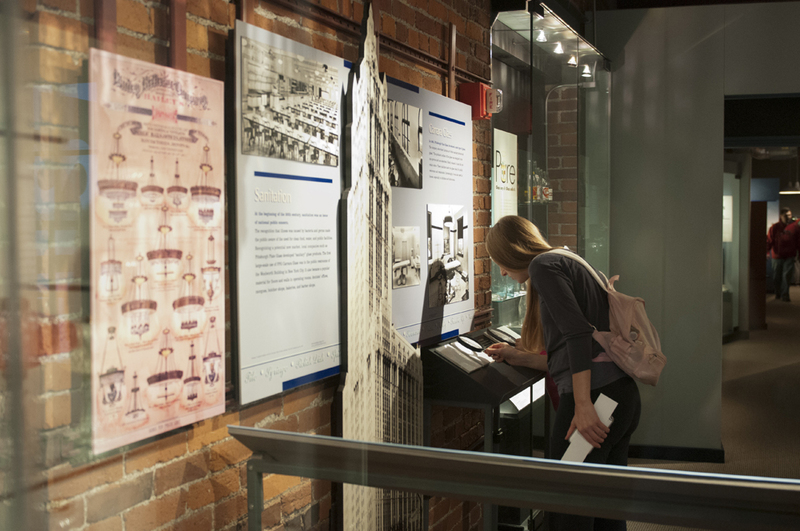 Pittsburgh-produced glass has been used in fine tableware for five U.S. presidents, as tiles for the walls of New York City’s great tunnels, and in searchlights at the Panama Canal. 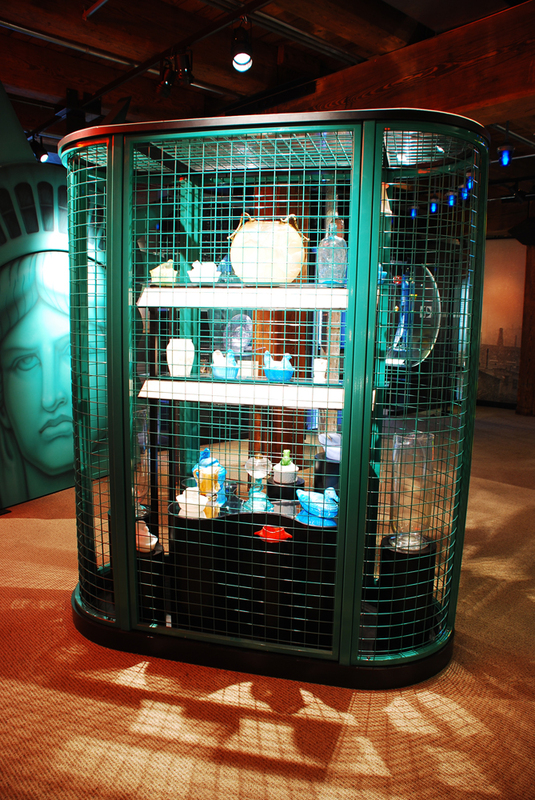 “Glass: Shattering Notions” is available in the Museum Shop, or in the History Center’s online shop. 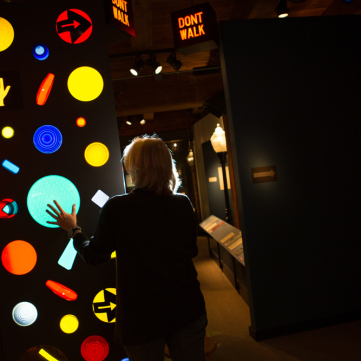 Glass: Shattering Notions is located on the History Center’s fourth floor. 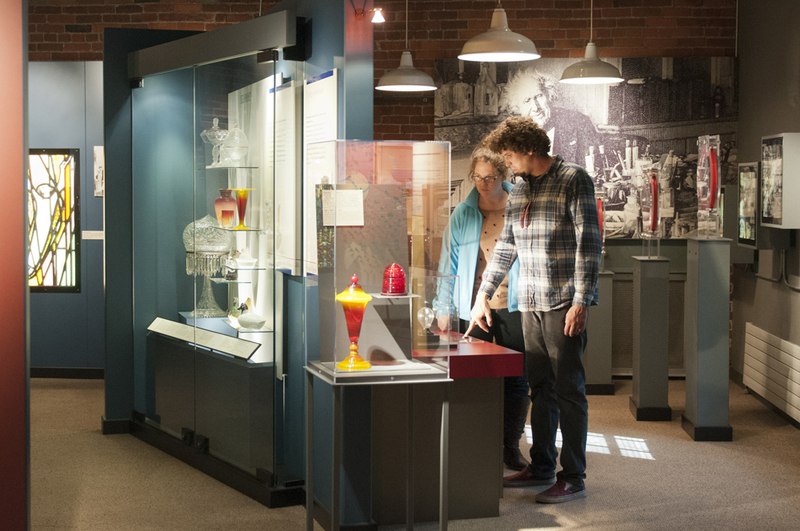 Pittsburgh’s glass-making history is featured inside Glass: Shattering Notions. 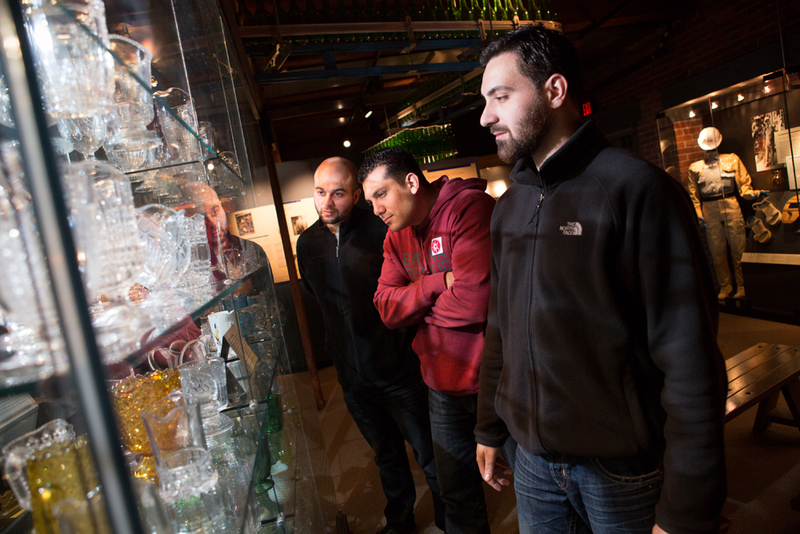 A family enjoys a display in the glass exhibit. 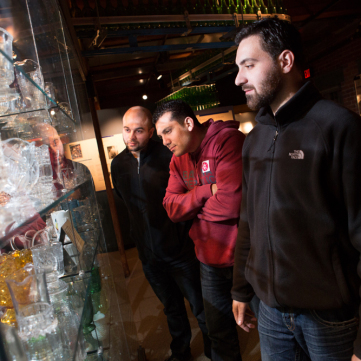 Visitors look at the various pieces of glassware made in Pittsburgh on display. 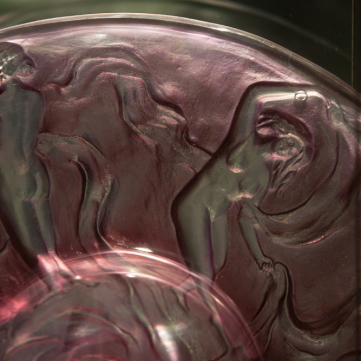 Colorless glass with applied amethyst ceramic color, pressed. Colorless glass with applied amethyst ceramic color, pressed, from the Consolidated Lamp & Glass Co., Coraopolis, Pa., c. 1928. Museum Purchase, Hillman Foundation Funds. View directional signals, blue taxiway lenses, "don't walk" signs, and more. 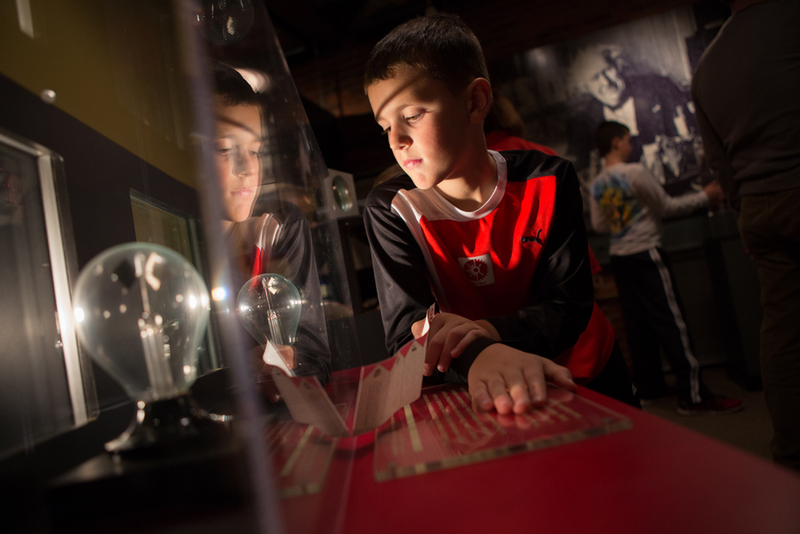 A young visitor observes two light bulbs, one with heat-absorbing glass and one without. 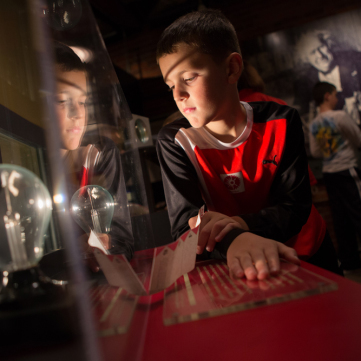 A variety of interactive activities appeal to visitors of all ages inside Glass: Shattering Notions. This piece of waste glass had to be chipped out of a furnace after the material failed to melt properly. This piece of waste glass had to be chipped out of the furnace at L.E. Smith in Mount Pleasant, Pa. after the material failed to melt properly. Adams & Co. and U.S. Glass Co., Wildflower or #140 pattern, Pittsburgh, 1875-1900. 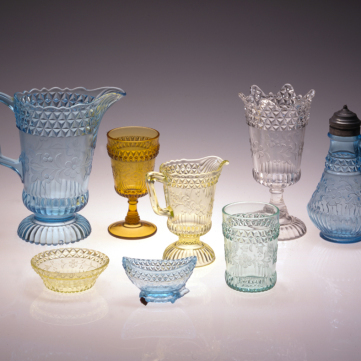 By the 1870s the average consumer had a wide variety in the pattern, decoration, and color of glass made for use in the home. Bequest of Mrs. Harry G. Dunmire. 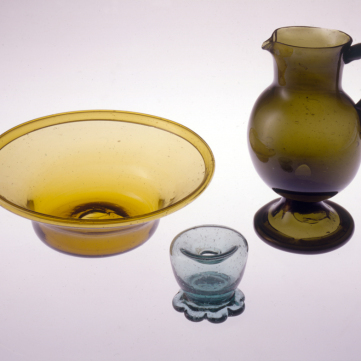 Window glass and simple functional objects became the first glass made in the Pittsburgh region. 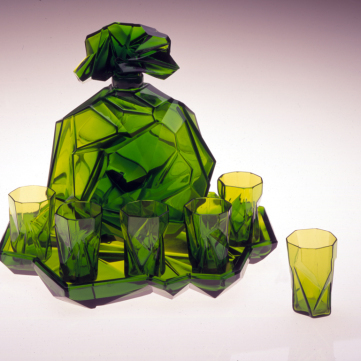 The colors often resulted from impurities or minerals in the sand used to make the glass. Museum Purchase, Gorley Fund, gift of Mr. and Mrs. J. Harry Gorley. 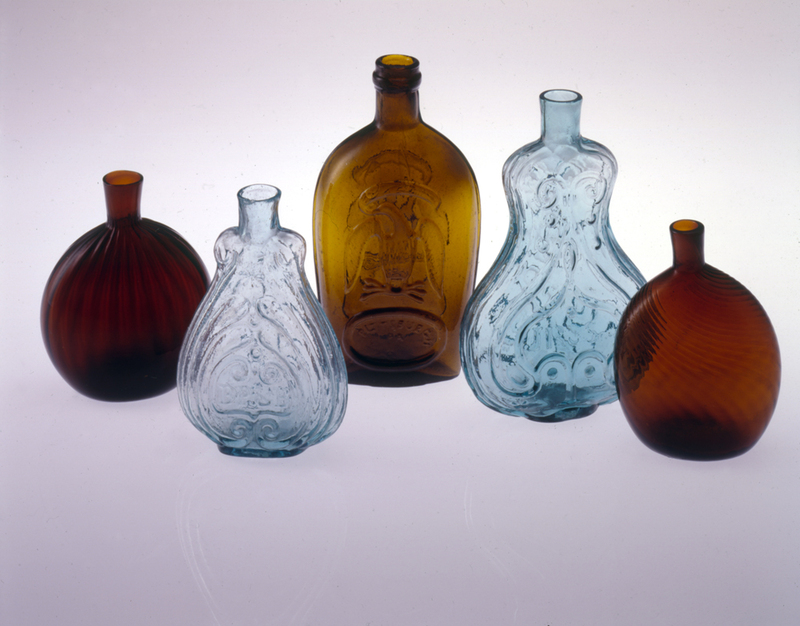 Produced in dozens of patterns and shapes, many bottles fit snugly in a pocket, accessible to the owner. 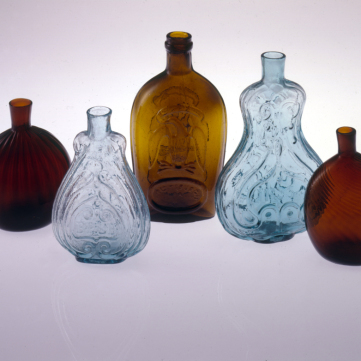 Produced in dozens of patterns and shapes, many bottles fit snugly in a pocket, accessible to the owner. Designs often incorporated the maker’s name and location. Museum Purchase, Brendel Fund, gift of L. Earl Dambach, Bequest of Charles McClintock, Gift of Pittsburgh Chapter, Early American Glass Club. 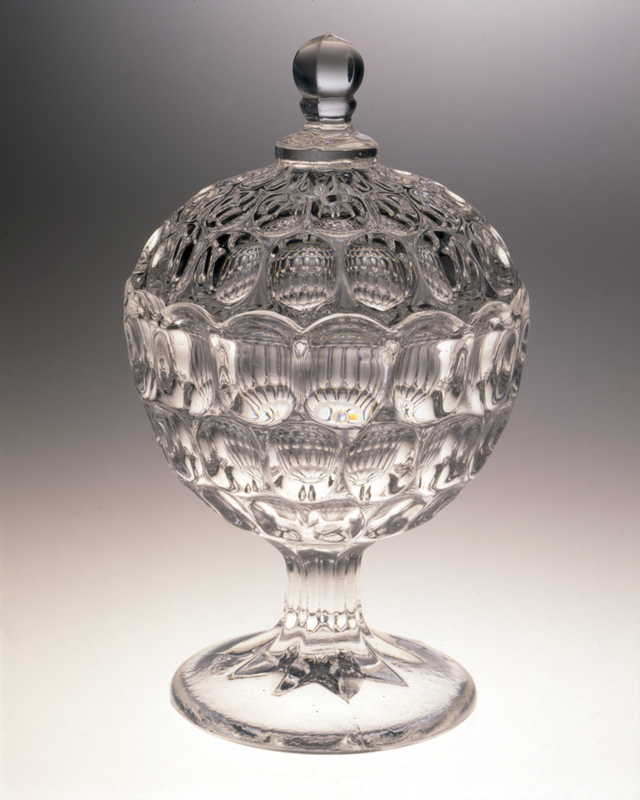 Compote in the Argus pattern, made by Bakewell, Pears & Co., c. 1860. Early pressed patterns mimic the more exopensive cut patterns popular at the time. 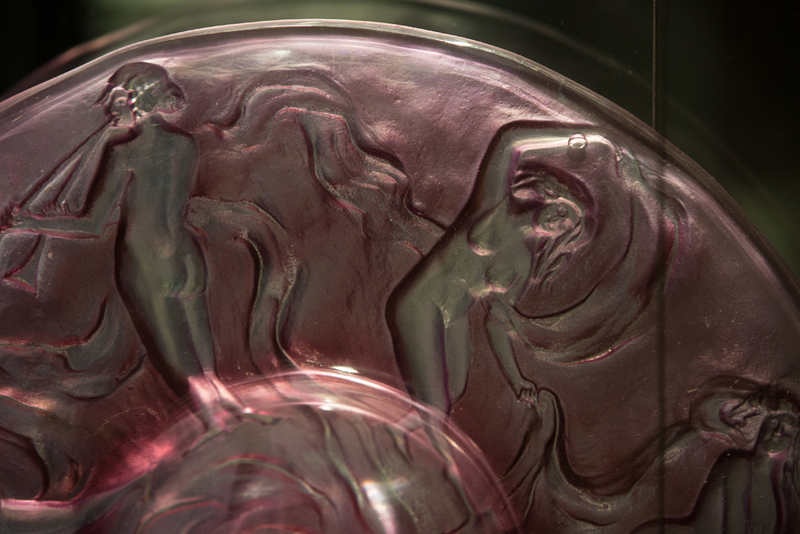 The quality of this piece attests to the skill of both the mold maker and the glass maker. 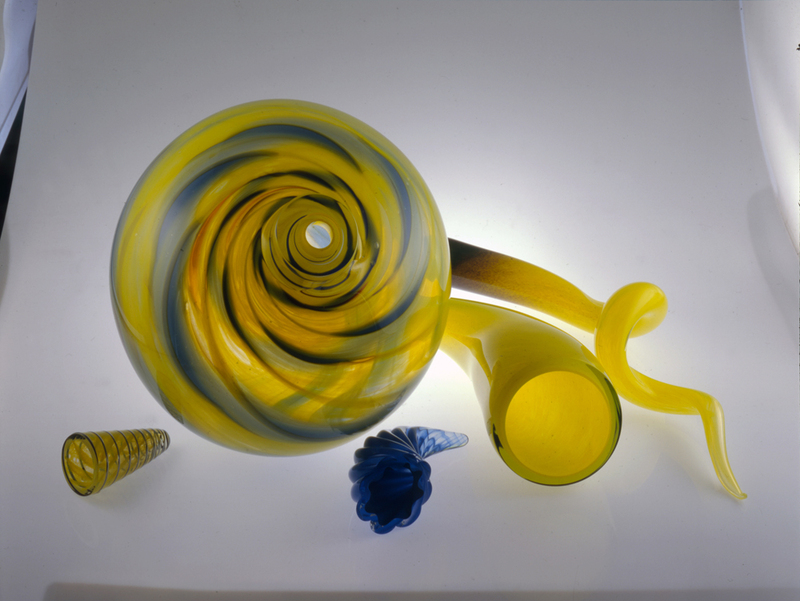 Glass art is still being created in Western Pennsylvania today. 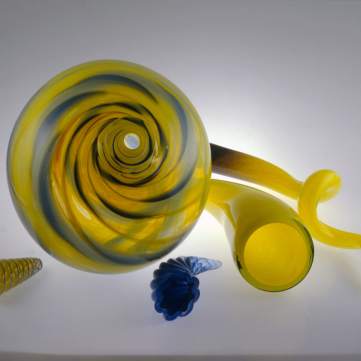 Glass art is still being created in Western Pennsylvania today. 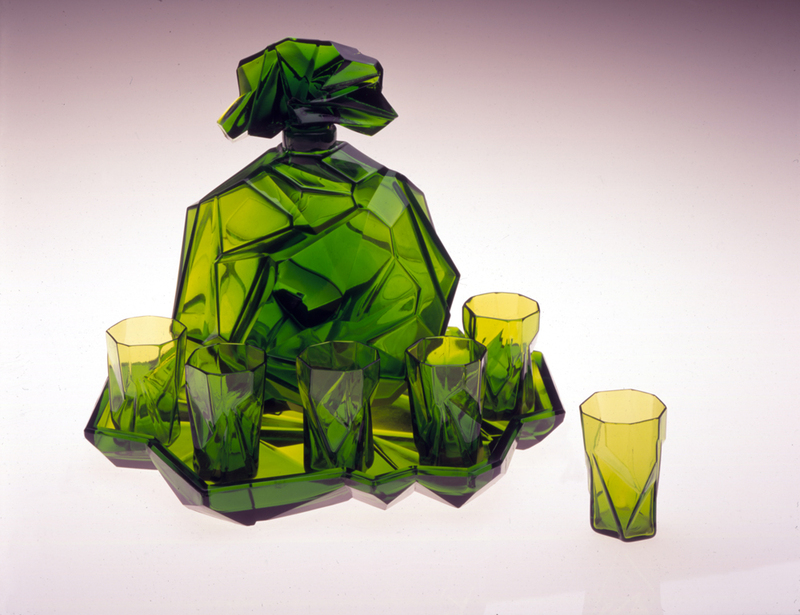 Mulcahy served as a co-founder of the Pittsburgh Glass Center – opened in 2001 it is one of the top glass art facilities in the United States and connects the city to its creative future through the use of glass as art. Museum Purchase, Hillman Foundation Funds and gift of Kathleen Mulcahy. Made by Consolidated Lamp & Glass Co., Coraopolis, Pa., c. 1930. Inspired by Cubist Art, designer Reuben Haley created and launched this innovative line in 1928. 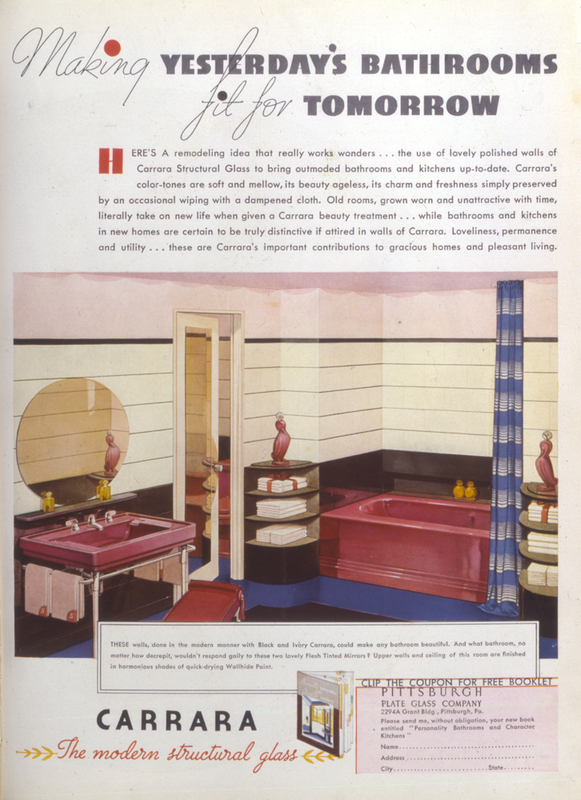 Carrara glass, made by Pittsburgh plate Glass, House and Garden, 1935. During the Depression the market for Carrara glass shifted from large buildings and store fronts to consumer households. 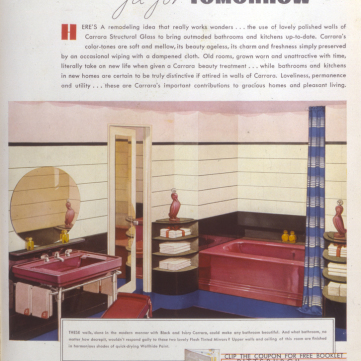 This ad positioned the glass as a new modern material for remaking the home. Courtesy of Hunt Library, Carnegie Mellon University. 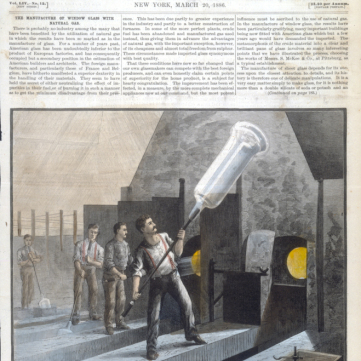 Blowing cylinders for window glass, Scientific American, March 20, 1886. Before machine technology, blowers inflated huge cylinders of glass up to eight feet in length. Those cylinders were scored down the middle, reheated, and flattened before being cut to size.